One deck of cards, ten different games. There are word games for one player. There are word games for multiple players. There are word games for adults. There are word games for kids. There are letter recognigation games. There are a lot of games in this little box and we are still creating more with no end in sight. If you have a love for the letters I'm sure we have a game for you. The number of players, playing time and minimum age listed on this page are very general and vary depending on the game you choose to play. 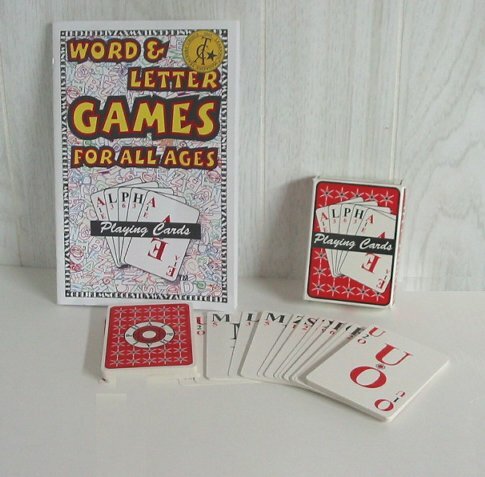 Alpha Playing Cards is a versatile deck with the letters of the alphabet printed on each card. Being a game system rather than just a game, it comes with rules to several word games for all ages of players. Iâ€™m not a fan of most traditional word games, but Iâ€™ve found the ones for this deck to be relaxing and an enjoyable change of pace. One nice feature of these cards is the â€œsemi-wildâ€� nature of the vowel cards. Each such card has two vowels on it, so a player may decide which of the two vowels heâ€™ll use in his word, making it more likely heâ€™ll have the letters he needs. The cards also have a value for each letter which is used in scoring many of the games. The rules provided by the designer include twists on classic card games like Word Rummy and Alpha War. There are also completely original word games based on finding words from cards on the table and from a playerâ€™s hand. My personal favorites have been Word Rummy and Word Snake, a real-time game that breathes life into a genre of games that is often slow paced. To get a look at all the rules for the games, I suggest you visit the designerâ€™s site at www.tjgames.com. My personal recommendation may not mean much, as I was beaten soundly in Word Rummy the other night by my wife when she played the rather ordinary word â€œchangesâ€�. Iâ€™m no word freak! Still, if youâ€™re into word games or if youâ€™d like to buy a gift for someone who is, I suggest a close look at this deck of cards and be sure to check out the reviews for this game on the Board Game Geek.